Today is a day where I am really feeling the distance part of a long distance relationship. We are working hard to close the gap. Resumes have been going out and applications have been filled out in hopes that Chris can find a job down here and be in Los Angeles on a permanent basis. I know at heart that he will eventually be here but until then there are times when it is difficult to not be around the person that I love. Much of my life feels like a series of long distance relationships. Not just with people but also with places. When I lived in London, I would get a bit homesick for the States. Now that I am back in the States, there are times when I miss London and my British friends so much that it hurts. Then there is my relationship with the Philadelphia area. To some extent, we are all products of where we grew up. My formative years took place in Bucks County, Pennsylvania which is not too far outside of Philadelphia. I haven’t lived in the area for nearly 18 years but yet there are times when I miss the culture of the area. Philadelphia food is a big part of those homesick moments. Which goes some way to explain why I was happy when I noticed that a new cheesesteak place was opening in my part of Koreatown. For several weeks, there was a mystery as to what was going into the newly renovated space on the corner of Oxford and 6th. We were driving by one afternoon when I saw a sign sitting in the door way that had the word ‘Whiz’ between a bun.Chris would have to confirm it but I may have actually squealed. 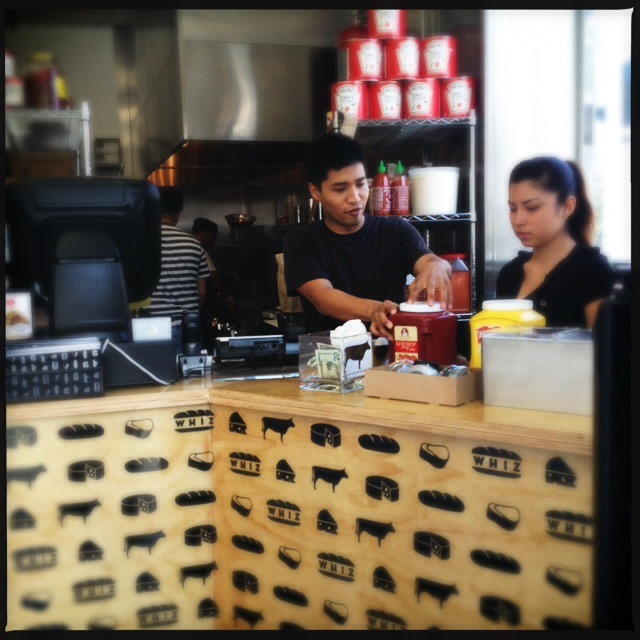 Whiz finally opened in Koreatown this week and I couldn’t resist checking it out. 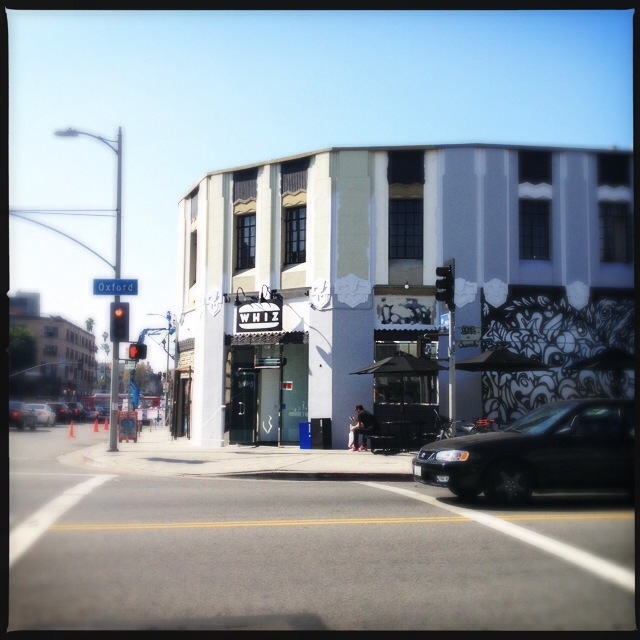 From the outside,Whiz looks pretty good. Before they began their renovations,the space they are in was abandoned and a bit of an eyesore. I presume,they are responsible for repainting the storefronts of all the shops on that block to look uniform. It makes everything look so much better and helps to create the street corner joint they are trying to portray. 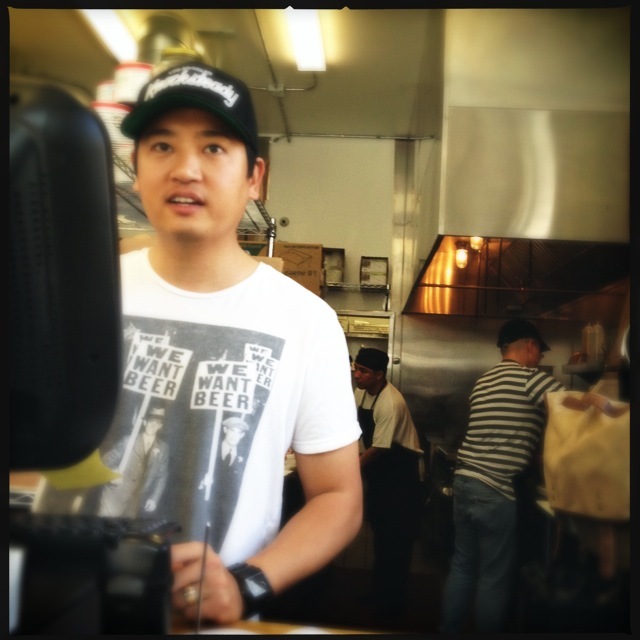 What I didn’t know before today was that is that the people behind Whiz in Koreatown are the same folks that run the nearby (and rather excellent) Beer Belly. I knew that there was a Philadelphian on the staff at Beer Belly. So, that does make sense but honestly, my brilliant power of deduction didn’t kick in until I noticed that it Jimmy Han taking my order. I’m guessing other people already knew because the place was packed. It also shows that the areas has been aching for a place to get good fast food that is outside the Asian flavor profile. 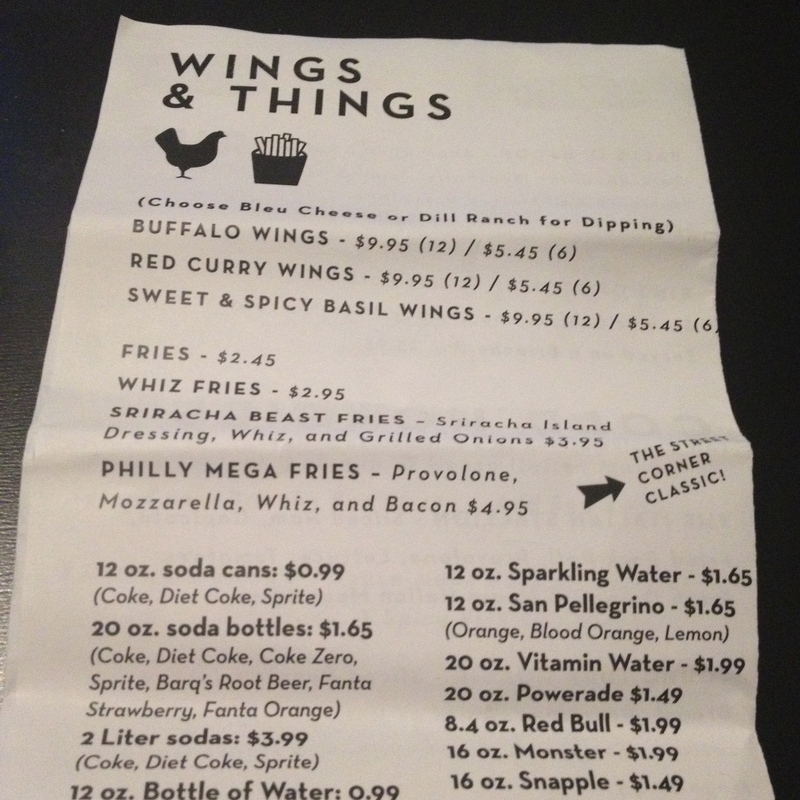 Whiz is smart to be offering burgers as well as cheesesteaks on their menu. Carls Jr, a street away, is the only burger joint within blocks and is only ever a last resort if I have an unbeatable craving for a burger. The price point for the burgers at Whiz aren’t that far off the Six Dollar Burgers and they can’t possibly be worse tasting. Burgers will have to be another day though because on my first visit to Whiz it was all about the cheesesteak. I placed my order for their signature Whiz Wit cheesesteak and fries. Perhaps if I didn’t know that Whiz had connections to Beer Belly I would be less critical of the fries. There was nothing particularly wrong with them but they were pretty much just fries. 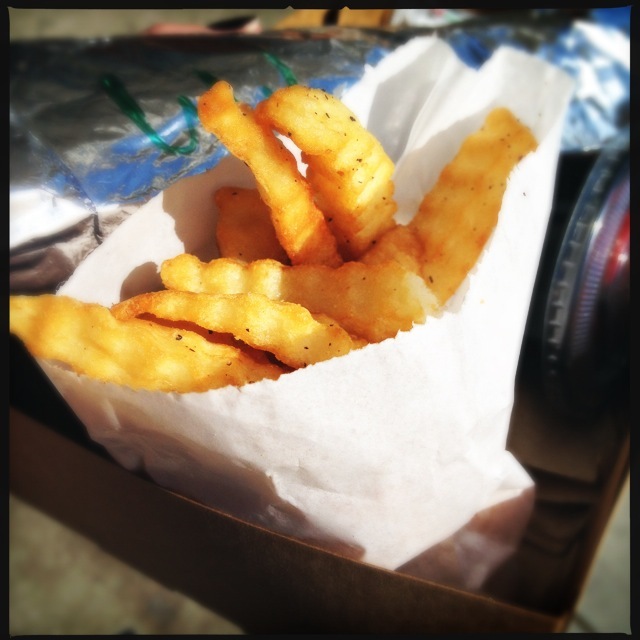 Beer Belly is the home of the famous duck fat fries which end up on just about everybody’s list of the best fries in Los Angeles. So, just a normal fry feels like a bit of a disappointment. As I said though, it was all about the Whiz Wit. The Whiz Wit is a Philly cheesesteak with grilled onions and housemade Cheese Wiz. 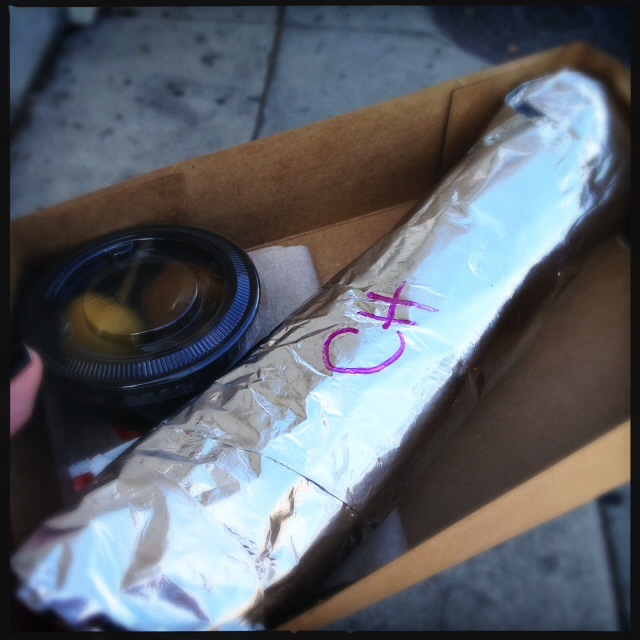 The cheesesteak from Whiz in Koreatown passed the first test by being on an Amoroso Roll. 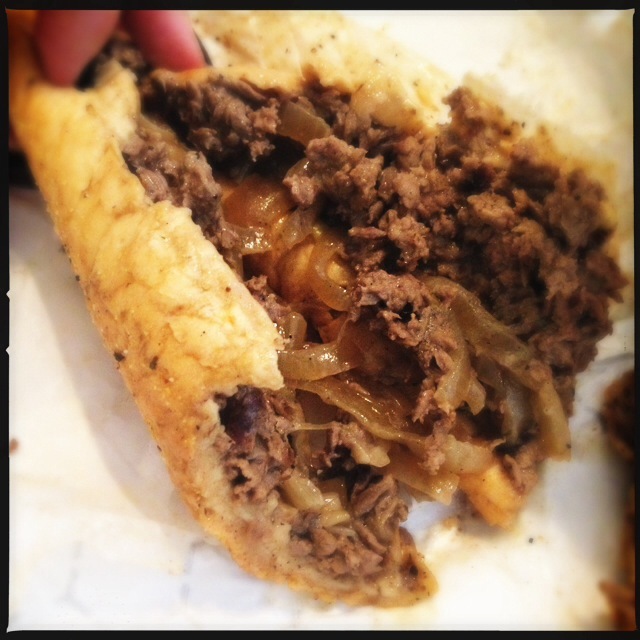 Forget about the meat and all the other elements, it isn’t a true Philly cheesesteak unless it is on an Amoroso Roll. There really is a difference. I admit to being an Amoroso snob. 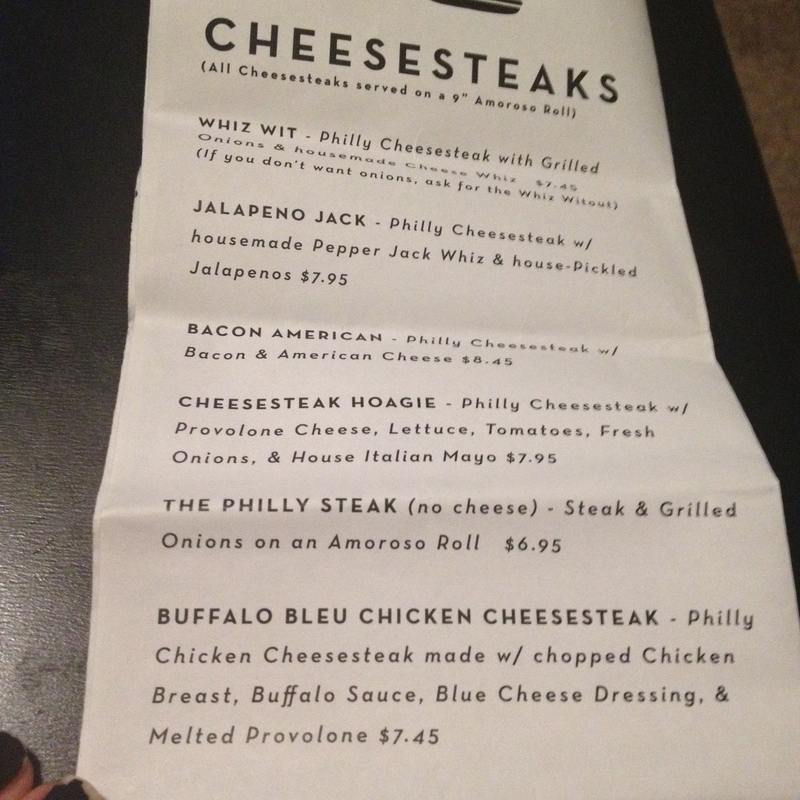 If a place outside of the Philly area, just calls a cheesesteak a cheesesteak then I will cut them some slack. However, the moment they go the whole way and call it a Philly cheesesteak than it has to be on an Amoroso Roll. Period. I’m happy to report that Whiz got their Philly cheesesteak just about right. The meat was chopped well and tasted good. The housemade Cheese Wiz was tasty. A compliment since I am normally part of the anti-whiz camp of Philadelphians. Together, it all tasted pretty good. However, there is room for improvement. What I have found from a lot of cheesesteaks I have had outside of Philly stands true for Whiz as well. The cheesesteaks are too dry. The Amorso Roll can stand up to meat juices and lots of gooey cheese. You should have to wipe your chin after taking your first bite and that just isn’t the case here. Back home, I rarely put ketchup on my cheesesteaks but on several occasions, I found myself dipping my Whiz Wit. It was still yummy and it is early days for Whiz. I’ll cross my fingers that they juice up the steaks a bit more and become the best Philly cheeseteak in Los Angeles. There is a bunch of stuff other than traditional cheesesteaks on the Whiz Menu that look interesting. The Bacon American cheesesteak sounds intriguing. 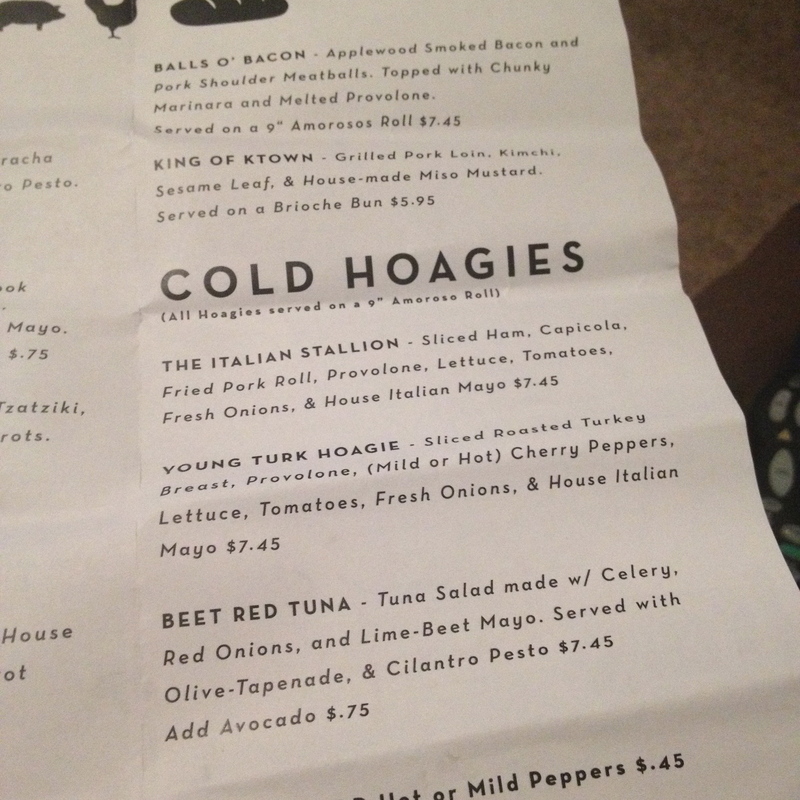 Hoagies that are actually called hoagies rather than a sub has my interest peaked too. I think next on the list for me is going to have to be the Balls O’Bacon meatball sub. 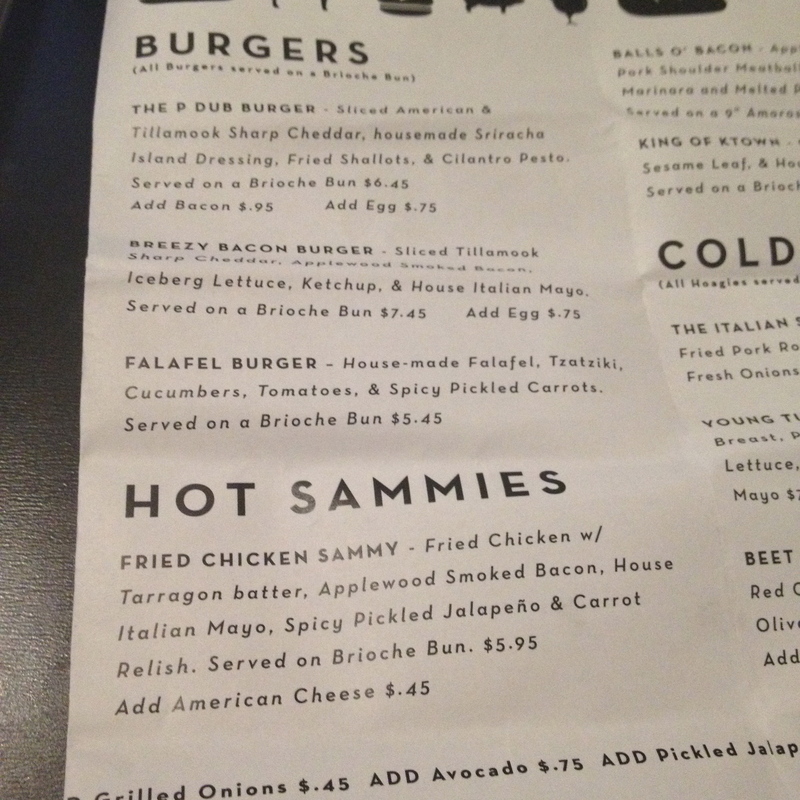 I overheard Jimmy telling somebody that was the sleeper item on the menu. So, I need to get my hipster on and tell everybody that I tried it before it was cool. Welcome to the neighborhood, Whiz. We are glad to have you. 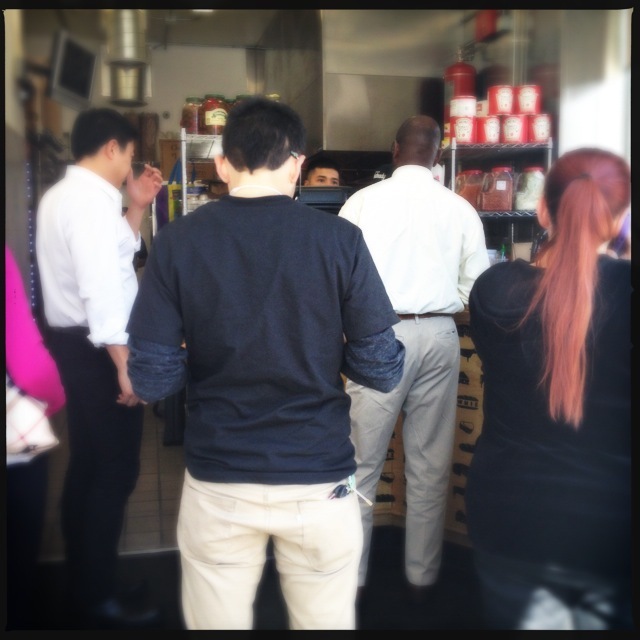 This entry was posted in Eating Out In Los Angeles and tagged Beef, Koreatown, Menus, Sandwich. Bookmark the permalink.